Specifications – Laserline Optics Canada Inc.
Dimensions: Please consult individual lens drawings for detailed dimensions. 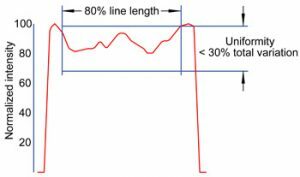 Line uniformity: Maximum 30% total variation in line intensity measured over the central 80% of line length. Contained Power: 80% ±5% over central 80% of line. Coatings: By request, minimum quantities apply.